RUSH: Anybody watch the college football championship game last night? 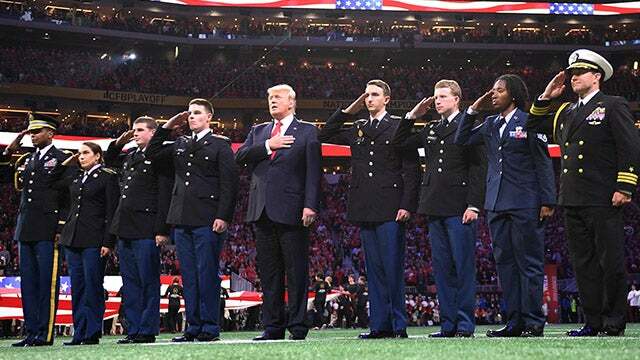 Donald Trump walks on the field at the 40 yard line for the national championship game, national anthem, singing along, heart covered by his right hand, and, I mean, the place erupted in cheers. Now, the Drive-By Media is saying there were some boos. I haven’t talked to anybody who heard any boos. Now, there had to be some of course, I mean, the place was filled and the law of averages is such. But the cheers and the support for Trump is overwhelming. And, you know, ESPN’s televising the thing, it had to just destroy them to see Trump show up and then to have this kind of reception and this kind of support that he got and for showing up in the national anthem and standing and putting his hand over his heart and singing along with it. And then you find out after the game last night that the college football ratings were through the roof. Meanwhile, ratings for the NFL wild card weekend were down double-digit percentage-wise all four games Saturday and Sunday. And Trump in a little bit of a microcosm last night, the college football championship, illustrated exactly why. 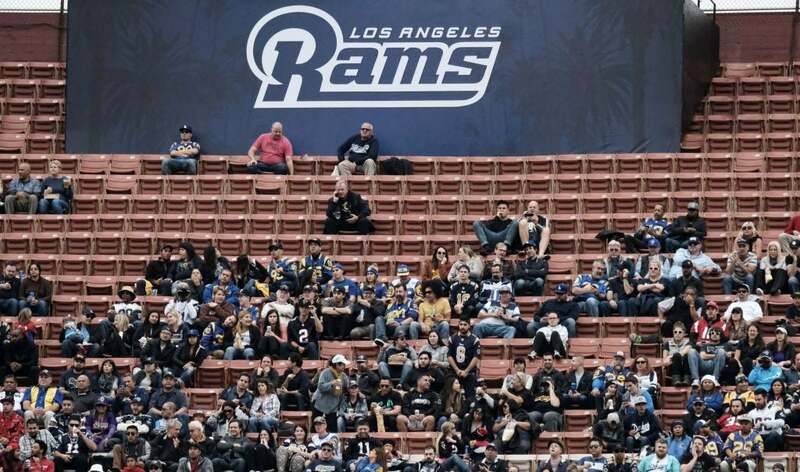 In addition to the college football ratings being way up where there are no kneelers, where there is no disrespect for the American flag or the country, the NFL playoff games double digital ratings decrease and the Golden Globes ratings were down from 2017. They fell to a six-year low. Now, what do these two things have in common? The National Football League plummeting ratings throughout the season and the Golden Globes show, ratings down, a six-year low. What is the thread that runs through both of these? Yeah, yeah, yeah, the protest thing, but what’s behind the protest thing? Liberalism is what the thread is. Liberalism is running through this, the left. The forgotten people in flyover country do not want to see all of these wealthy millionaires lecturing them on how horrible they are and how horrible the country is. It doesn’t compute. Your average, ordinary American watching Hollywood celebrities with their vast displays of wealth and power, you know, just entertain us and go home. Don’t preach to us. What gives you the right to preach to us? They can try it, they can do it, but it isn’t working, and the more they preach in actual movies and in their award shows, you see what is happening. And what is being demonstrated here is that people are demonstrating, proving slowly that they can live without Hollywood awards shows. And more and more people apparently can live without the National Football League. Now, what if that establishes as a habit? What if this establishes a new normal for people to begin tuning out these two entities that have become major institutions, dominant institutions in America. And this I don’t think is a one-year one-off. It’s not something peculiar to 2017. This I think is a major trend. Look, if this were happening in your business, if you were losing audience like this, if you were losing customers like this, you would be deathly concerned. You’d be panicking. You’d be working on ways to reverse it. These people aren’t. They are doubling down every time the American people show their displeasure by walking away from these events and not watching them. This is typical of the liberals, by the way. The Democrat Party is the same way. They get rejected, and they don’t try to find out what went wrong. They double down on that which is driving people away, which is why I am not part of a group of people that thinks the Democrats are automatically going to win the House in 2018 or the Senate or the White House in 2020. But the media is, aren’t they? The media’s convinced they’ve already won 2018. “The American people,” they’re convinced, “already hate Trump. “They now believe Trump’s insane. They believe Trump’s a lunatic. They believe Trump should not be where he is.” As such, they think they’ve already won the 2018 races. They are in such bad shape that they’re having to look at somebody who’s never run for office as their savior, after spending the last two years criticizing that very kind of candidate! They have spent the last two-to-three years ripping Trump for all the reasons under the sun, and what are they now doing? Producing their own version of Trump! This is a party that is seeking an identity that they have lost, that they have no idea how to modify or modernize, and if Trump continues to succeed — which he will. RUSH: We start on the phones with Ann in Akron, Ohio. Great to have you. Welcome on the program. CALLER: Hi. Thanks for having me. CALLER: Hey, I personally think that the NFL would have had worse ratings if it wasn’t for fantasy football. Because the way fantasy football works is prior to the season, everyone got together, they pick their players, the players play on various teams. You watch throughout the weekend various games. It doesn’t matter who you actually like because you want to watch your team do well for fantasy football. And then it lasts two weeks into the playoff season. So this past weekend when the ratings really went down, these past playoffs weekend, is because I believe it’s because of fantasy football. RUSH: You know, it’s an excellent point. Do you play fantasy football? RUSH: You do! I figured you’re in Akron, Ohio, you must. CALLER: Yes. So I personally believe that if fantasy football didn’t exist that the ratings of the NFL would even be more disastrous than they are. That’s my personal opinion. RUSH: You know, you may have a point. You really have a point about the fall-off here for the playoff weekend. The NFL, for the longest time, tried to hold off fantasy football. And not just because of the illusion that the NFL does not like to get involved with gambling. They actually try to tell you that. The reason they tried to hold it off is because fantasy football eliminates rooting for a team. And rooting for a team is the foundation of TV ratings. It’s the foundation of licensed merchandise sales. It’s the foundation on which the league has been built. It’s the foundation of the television philosophy. And when fantasy football came along, people stopped caring. The people playing it — and it’s an increasing number every year — the people playing it stopped caring who won. It didn’t matter. Only how the individual players on their team did. Well, when the regular season ends and you’re down to, you know, eight teams playing on a weekend, there’s much less fantasy football action going on and much less reason to watch. So she may have a point about this, folks. That’s probably right on. RUSH: I just had this stupid story called to my attention. It’s a Mediaite story, and the headline: “Rush Limbaugh Credits [Trump] for National Title Game’s Big Ratings.” I did no such thing. They’re trying to say in this story that I said at the opening of this program that people watched that game in record numbers because Trump showed up during the national anthem on the 40 yard line. Let me read to you the quote: “During today’s broadcast of the Rush Limbaugh Show, Limbaugh tried to make the case that Trump placing his hand on his heart and (attempting) to sing the Star-Spangled Banner brought more eyeballs to the game. I never said it. “This thing” is the game, not Trump. It had to irritate ESPN to see all the support for Trump. In no way did I credit… Who would be fool enough to claim that the president singing the national anthem — when he leaves at halftime — is the reason people watch the game in record numbers? So whoever wrote this at Mediaite’s got it entirely wrong because they wanted to get it wrong. I didn’t say anything close to that! All I said was ESPN had to be driven crazy with the reception Trump got. ESPN televising “this thing” means the game, and Trump shows up during the game, getting all kinds of cheers and applause and it had to tear ’em apart. Trump was the reason people watched the game in record numbers? Didn’t say so. Don’t think so.